There was so much excitement this weekend, we can barely fit it all in one recap. From Iowa’s big upset at Big Fives and the Georgia win over Florida in Gainesville to Maya Reimers’ two-E-pass floor routine and DIII’s Shadae Boone’s Yurchenko one and a half, it was a weekend for the record books. Kaji won or tied for first on all three of her events on Friday, including this 9.900 floor routine, to lead the Hawkeyes to an upset win in the first Big Five meet. The junior missed most of last year with an Achilles injury but has returned to lineups with a vengeance. Her clean tumbling and leaps are matched by her joyous and precise dance; this routine is a joy to watch. It was a long time coming, and although this definitely wasn’t her best stick on this vault this season by a long shot, it was the one that earned her the perfect mark—well deserved nonetheless too. Another angle! Looks even BETTER! We’re so impressed, guys. We’ll start with the positives. Shadae Boone is a DIII gymnast for UW-Stout. She also did her club training at a little gym called Twin City Twisters. While DIII gymnastics is known for its unique skills and daringing performances, we were not expecting Boone to whip out this stellar Yurchenko one and a half—the first of its kind ever to be performed in DIII. (Shoutout to Steph Mager of Brockport who also stuck one in exhibition last week.) At this point you’re probably wondering why this vault is in “Most Carol Score” and not “Most Badass Performance.” Are you ready for the kicker? It only scored a 9.600. We’ll leave it at that. Not only do we love when commentators play to our gym nerd hearts with their words, but we love when a gymnast defies the odds and still comes out with a great routine. You don’t really know how hard performing your routine with no music is until you’ve done it, trust us. Leave it to Finnegan to fall pretty too. The senior is known for her gorgeous gymnastics but no so much for mistakes. However, we guess we can forgive her for the mistake when it’s as entertaining as this. Reimers was already doing the most difficult tumbling pass in DII with a tucked full-in for her typical opening skill. However, she decided to up the ante this week by mounting with a double layout and dismounting with her full-in. Yes, you read that correctly. She might have fallen on the full-in, but do you honestly even care? Everyone else needs to try harder next time. 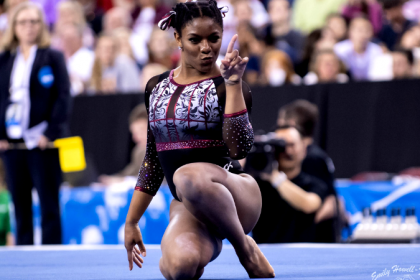 The Big Storyline: Oklahoma did not have its best day, having to count a out of bounds on floor and a low score on beam, but it still managed to score above a 197. Notably, Maggie Nichols was not in any lineups, presumably resting completely for the big UCLA matchup next week. West Virginia had a solid day, but it was apparent that the team was feeling the effects of a two-meet weekend, having some uncharacteristic errors on floor. Implications: As we move into NQS rankings, Oklahoma retains the No. 1 spot while West Virginia moves up two spots to No. 24. Records: Sydney Marler’s 9.825 on bars was a career high. The Big Storyline: UCLA had a strong yet not perfect meet, but imperfect landings from Utah meant that the Utes lagged by a few tenths throughout. UCLA rankings are still a work in progress: Ohashi vaulted again this week and Macy Toronjo cracked a competition lineup for the first time since 2017, scoring a 9.800 on bars. Utah finally broke out of its low-197 rut to set a season high in front of a sold out crowd. Implications: The switch to NQS this week means Utah will drop to No. 5, passed by LSU. NQS is also a boon for Kyla Ross who is now ranked No. 1 in the all around and in the top five on every event. Records: The Bruins tied their season high on vault. Controversies: A portion of the Utah student section brought newspapers to hold up during UCLA beam as a gesture of disinterest, leading to an incredible amount of sportsmanship discourse. The Big Storyline: Following a down-to-the-wire finish, Georgia beat Florida in Gainesville for the first time since 2008. Both teams put up strong performances, but the fact that neither got higher into the 197s was slightly surprising. Florida clearly still has weaknesses, especially on vault landings, but nothing happened tonight that showed these weaknesses to be detrimental. Implications: With tonight’s loss, Florida has now reopened the door for Auburn to snag the SEC regular season title. But if Florida wins next week at Arkansas, it will take home at least a share of it. Records: Georgia’s Marissa Oakley earned a career high 9.950 on bars. Teammate Rachel Baumann earned a beam career high of 9.925. Controversies: The meet came down to Alyssa Baumann’s floor performance after Sabrina Vega scored a 9.950 on beam for Georgia. A. Baumann would have needed a 9.925 on the event to win it for the Gators, but errors kept the score at a modest 9.825. The controversy came in as many thought A. Baumann’s routine was evaluated more-strictly than any other at the meet. The Big Storyline: Neither team came away with a huge score by their standards, but Arkansas will find this 196-plus score to be nothing to scoff at either. Other than some bars issues, the Razorbacks did not show many weaknesses and will look forward to next week’s home matchup against Florida to get another big home score (even if it likely won’t be enough to win). Implications: Neither team should see much movement in the rankings. Records: Arkansas posted a season high team score this week. Reagan Campbell earned her first ever event title with a 9.900 beam score. The Big Storyline: Denver continued its success with another meet above 197; four straight meets above the mark is something the Pioneers have never done before. Boise State got off to a great start on beam, but ultimately scored just a 196.375, a number that it will appreciate having as a road score for now. The Broncos showed great resilience after standout senior Shani Remme had to stop her floor routine with an apparent injury and could not finish the routine or the meet. Iowa State rebounded from its lackluster performance last weekend at the Mardi Gras Invitational to put up a solid road number. Implications: Denver’s 197.725 ensures that it can count its previous 197.625 in its NQS and maintains its No. 6 national ranking. Boise State drops three spots to No. 13 while Iowa State gains the same number in reverse to move up to No. 26. Big 12 and MRGC rankings remain unchanged. Records: Denver’s 49.550 on beam is a new program record. Its previous record held for 15 years prior to this meet. Isabella Amado’s 9.875 on beam is a career high, as is Gabriela Bouza’s 9.850 on vault. The Big Storyline: This meet was on fire, and we wish everyone could have been able to see it. The first rotation kicked off with a bang; all four teams on the floor surpassed 49.000 and we saw the inevitable Natalie Wojcik 10.0 on maybe her fifth-best Yurchenko one and a half of the year. The crowd was large and loud, fans were thrilled and the gymnastics was amazing. Michigan went on to put up a huge nationally-competitive total, proving last week wasn’t a fluke, winning the meet and the Big Ten regular season title. Minnesota had an excellent outing with a few small mistakes that kept it from the big score it can hit, and Illinois claimed the final spot in the championship evening session with a solid hit despite being forced to explore the depths of its talent due to continuing injuries. Implications: Because Michigan has only put up two 197s, it will slip to No. 9 with the switch to NQS (why is this our life) this week. Michigan’s total has only been bested by Oklahoma, UCLA and Florida this year, which is a very interesting fact considering the switch to Four on the Floor this year. The Wolverines’ 49.625 on bars is its second-highest in program history. Minnesota also saw career highs on every event except floor, Rutgers’ Emily Drauss saw one on bars. 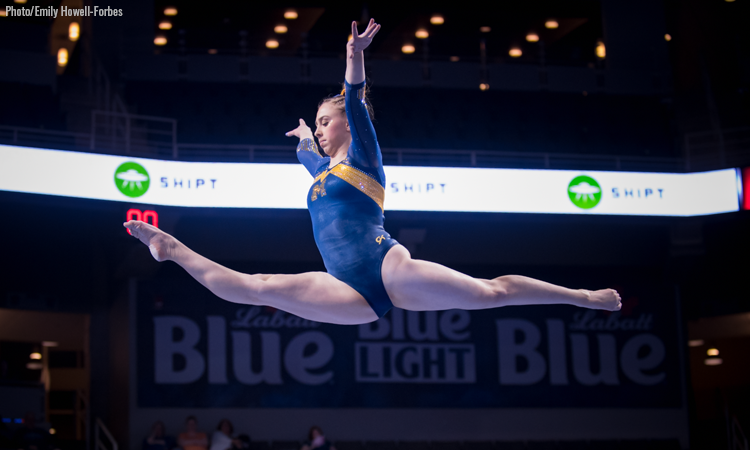 Records: Michigan tallied a number of career highs, including five in the bar lineup and Karas’ 9.900 on beam. Controversies: There was confusion over Belle Huang’s beam score for Rutgers. Evidently, she doesn’t have a backward element as required, other than her dismount. Umme Salim-Beasley had a very intense conversation with the head judge about this, but ultimately Huang’s score stood. The Big Storyline: Kentucky continued its streak of record-topping meets with another big 197-plus score at home. Before these scores, the program had only reached that mark four times, and they’ve all happened during the era of the current senior class. If Kentucky can keep this momentum going, the Wildcats will be a formidable threat for another SEC evening session slot. Implications: Kentucky will expect to rise three spots to No. 10 while Alabama will jump to No. 8 thanks to the switch to NQS..
Records: Kentucky’s Sidney Dukes earned a career high score of 9.925 on floor for the Wildcats. The Big Storyline: Auburn’s impressive momentum seemed to stall a little today, with the team scoring its lowest team mark since its sub-194 meet to start the season. It doesn’t spell disaster for the Tigers—as the two falls on floor were more flukes than cause for concern—but they’ll need to shape up if it wants to continue contending for the SEC regular season title next week, and beat Alabama for just the second time in many, many years. Implications: Auburn may fall slightly in the rankings this week due to its lower-than-average road score, which it definitely will not want to use for NQS. TWU will jump to No. 54. Controversies: The meet was paused for around 30 minutes due to a scary fall from TWU senior Jenna Cashmore who peeled off the bar after catching her Gienger. She was checked out by the training staff and eventually taken away on a stretcher for further evaluation. However, she was spotted after the meet and appeared to be OK. The lengthy delay resulted in both teams being allowed to have a four-minute open stretch period before heading into its rotation three touch. 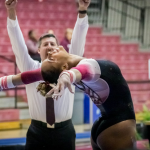 In funnier news, TWU’s Hunter Vincent had an unfortunate fall on her beam dismount, which is literally just a forward roll onto the beam, and gave a head shake and smirk to head coach Lisa Bowerman before hopping back on to finish (or really start, to be honest) her set. The Big Storyline: This was a super close meet with just a quarter of a tenth separating the final scores. The 196.625 is a season high for the Sun Devils in a meet that is arguably the team’s most put together meet thus far. Oregon State had miscues here and there but still put up a respectable number, making this meet all the more interesting. Implications: Oregon State drops to No. 15 overall and Arizona State drops to No. 21. This score at ASU should help the Beavers in the next couple of weeks since the bulk of the team’s higher scores have been at home. Oregon State drops to No. 4 in the Pac-12 while Arizona State remains at No. 6 in the the conference. Records: Kaitlyn Yanish’s 9.900 on vault is a career high. Controversies: Not exactly a controversy, but let’s talk about how this was Arizona State’s senior night, even though it still has a home meet left. Word is it was easier for families of seniors to travel in for this meet versus its final home meet, which is on a Wednesday. The Big Storyline: This was California’s first meet without Toni-Ann Williams, and the team held its own. The Golden Bears put together one of their best meets of the season with a complete team effort all around. Washington will be happy to have a road 196 so it can drop some of its early-season 195s, but this was still not the Huskies’ best meet with areas to improve, especially on bars and beam. Implications: California moves up to No. 14 overall while Washington moves up to No. 17 with RQS taking effect and lower scores able to be dropped. The Big Storyline: Iowa was exceptional here, led by a career night from Clair Kaji; the best team on the day took the win and the only 196. Nebraska, which struggled in warmups, looked fine but not excellent all day. It only had two (non-counting) falls, but little landing errors and some sloppiness—especially on beam—held the team back. Penn State had a counting fall on beam, but still put up its second-highest total so far to secure the third championship night session spot. The whole thing was tight, with Maryland only missing the third spot by a two tenths. Implications: Iowa will rocket to No. 33 nationally while Nebraska drops to No. 18, Illinois sits at No. 30, Penn State falls to No. 27 and Michigan State leaps to No. 37. Maryland remains steady at No. 32. Controversies: The arena was incredibly dry, even as arenas during Midwest winters go. Both Sienna Crouse and Sarah Hargrove had nosebleeds during warmups and this is presumably why Crouse missed the first rotation. The Big Storyline: Southern Utah pulled off an upset versus conference rival BYU after the Cougars had a messier-than-usual first rotation and the Thunderbirds put up a season high on floor. They were missing Hannah Nipp, who felt dizzy before the meet, but upperclassmen stepped in including Autumn Jorgensen who made her season debut on floor. Implications: BYU will drop to No. 19 this week while SUU will be briefly unranked since it only has two away meets to date. Controversies: This meet was soooo slooooow, finishing over two and a half hours after the scheduled start. Most routines did not start until the other team’s last routine had even been scored. The Big Storyline: Kyla Bryant slaying at gymnastics and Twitter icon Casey Magnesium (Magnuson) killing the commentary game highlighted this meet. The Cardinal was down a few routines after Taylor Lawson sat out due to illness but still pulled off a convincing season high. Implications: Stanford will rise to No. 22 with the shift to NQS while Arizona drops to No. 28. Records: The Cardinal registered its first conference win in over two years. Controversies: The meet did not have live scores of any kind, and we did not learn the scores from any Arizona routines at all until about an hour after the end of the meet. (Stanford hilariously tweeted a blank score graphic at one point.) It was also incredibly quick, coming in under an hour and a half, which we later learned was due to a time crunch for Arizona to catch its flight home. Implications: As we head into official NQS rankings, West Virginia moves up two spots to No. 24 with Pittsburgh dropping two spots to No. 38. Ball State moves up a spot to No. 44. Records: Arden Hudson’s 9.875 on beam is a career high. Sophie Bochenek scored a career high 9.800 on vault. The Big Storyline: N.C. State recorded another solid score en route to a sweep over the rest of the field in Raleigh. Of note, Lauren Kent debuted a new vault and competed in the all around for the first time in her college career. Implications: For the first week of rankings determined by NQS, N.C. State moves up to No. 25. Western Michigan drops a spot to No. 50 and William & Mary drops to No. 62. The Big Storyline: This competition was neck and neck throughout with ultimately only 0.375 separating first from third. Kent State came out on top, recording its third score in a row above 195 after getting off to a slow start this season. Implications: Kent State shoots up seven spots to No. 41 and moves all the way up from fifth to second in the MAC since it is now able to drop a low score from its first meet. George Washington and N.C. State both move up a couple of spots to No. 34 and No. 25, respectively. Records: Dara Williams’ 9.900 on vault was a career high. The Big Storyline: Utah State was comfortably in control throughout this meet, but it wasn’t without mistakes. After scoring a 196.025 last weekend at West Virginia, miscues on beam brought the team total to where it had been in previous weeks and away from the potential of the illustrious 196. Alaska actually outscored the Aggies on beam and was notably without Mackenzie Miller this meet. Implications: Utah State drops to No. 35 overall and not recording a score close to its season high means that it doesn’t have the benefit of counting that score now that the switch to NQS has occurred. Alaska moves up to No. 57 now that it has the benefit of dropping its abnormally low scores. It also moves up to No. 3 in the MPSF. Since Southern Utah doesn’t have enough scores for a RQS, Utah State moves up to No. 3 in the MRGC. Records: Alaska’s 48.775 on beam is the third-highest score on the event in program history. Controversies: Flash photography. Again. Utah State freshman Grace Rojas was allowed to redo her vault after a flash went off in the arena. The Big Storyline: North Carolina’s struggles with inconsistency continue this season, this time having to count two falls on beam in what was otherwise a solid meet. Danielle Mulligan continues to dominate in the all around this season, despite having never competed vault until 2019. Implications: Now that NQS starts this week, North Carolina drops to No. 43. It will need to take advantage of its next four away meets, so it doesn’t have to count a low 194 for NQS. New Hampshire moves up to No. 29. Records: Danielle Mulligan’s career high 39.425 in the all around is the fourth-best mark in program history. Controversies: When Lily Dean started her floor routine, there was a problem with her music, and she ultimately had to do the whole routine without it. Despite this mishap, she still scored a respectable 9.850. The Big Storyline: In its best-attended meet of the season by far, UIC put up a season best and the top score of the USAG teams on its senior night—and what may be its final home meet ever. Sophomore Kayla Baddeley has now put up two 39-plus all around totals in a row and remains ranked No. 1 on vault in USAG and MIC. If this is the end, what a way to go out. 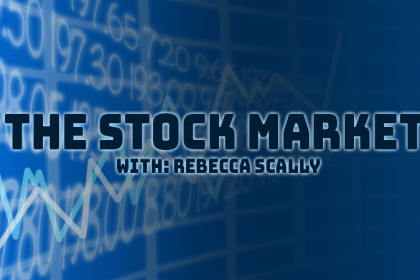 Implications: UIC is solidifying itself at the top of the MIC and USAG. Northern Illinois will fall to No. 3 in the MAC with the beginning of NQS. Records: Kayla Baddeley’s 9.875 on bars was a career best. The Big Storyline: After being added to the meet last minute, Kent State edged out host George Washington despite the Colonials recording their best floor score of the season. Implications: As NQS kicks in, Eastern Michigan drops a spot to No. 48 while Towson moves up two spots to No. 53. Records: Sarah Lippowitsch recorded a career high 9.850 on beam. Katya Karpova scored a career high 9.875 on floor while teammate Rachel Kaplan also set a career best on that event with a 9.850. Courtney Bezold scored a career high 9.900 on bars. Mary Elle Arduino’s 9.850 on floor was a personal best. The Big Storyline: Injuries. UC Davis all arounder Kyla Kessler devastatingly tore her ACL on floor. Since she was added to lineups slowly this year we know that Davis has the depth to survive her absence, but it’s a major loss nonetheless. Two SJSU gymnasts were also injured during the meet, and by the description given in the release it seems likely that they were Jasmine Henley and Tia Gin. If it’s true, it’s a miserable reality for a Spartan squad that was already struggling through 2019. Implications: Both teams will receive a two-place ranking boost this week. Records: Kelley Hebert’s winning all around total is No. 7 in UC Davis program history. 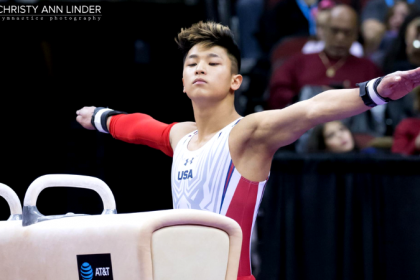 Taylor Chan set a career high of 39.250 in the all around. The Big Storyline: Central Michigan saw Northern Illinois and Kent State’s big scores last week and came back with a big total of its own. Denelle Pedrick continues to be an explosive all arounder, competitive not only within the conference but in the regionals conversation as well. Implications: The Chippewas now own the second-highest total in the MAC, behind only Kent State’s 195.800 last week. The Flashes had a solid day on Sunday as well, but the Chippewas will take over the No. 1 spot in the conference this week. Records: One of three career highs for the Falcons, Taylor Worthington’s beam total is a personal best. Controversies: Central Michigan’s head coach, Jerry Reighard, was placed on administrative leave this week, pending an internal investigation. No further details were given, but the athletics department has clarified that the leave has nothing to do with Nassar or a Title IX violation. The Big Storyline: Despite setting a season high mark, Temple fell to Division II powerhouse Bridgeport, which recorded its third 195 of the season. Implications: Thanks to being able to drop a couple of scores in the 191s, Temple moves up three spots to No. 47 as we enter the first week of NQS. Records: Maya Reimers became the first Bridgeport gymnast to compete a two E passes in a floor routine, opening with a double layout and closing with her usual full-in. Monica Servidio scored a career high 9.825 on floor. The Big Storyline: This meet was all about the red bird mascots: Redbirds vs. Redhawks vs. Cardinals. Ball State will be pleased with this total; it comes in a bit under its season best, but the team will now be counting three solid mid-194s in its NQS. Illinois State’s total is a 2019 high and means the team’s only other 194 will be counted. Implications: Illinois State will move ahead of Texas Woman’s in the MIC. Records: Anna Kaziska’s 38.875 is a career high. The Big Storyline: Sac State’s beleaguered bars lineup breathed a sigh of relief on Friday night as senior star Jackie Sampson returned, winning an immediate title both there and on beam. But the relief didn’t last. The Hornets suffered three more injuries at this meet, including Destiny Watley and Shaye Mathias plus one other we don’t know yet. It’s devastating for the Hornets who have had a tough season already. Implications: Sacramento State moves up to No. 63 and stays clear of conferencemate Seattle Pacific despite the loss. We saw a Tweet saying she had ACL surgery recently, but it was from an unconfirmed and unofficial source. We will let you know if we see anything more official and will also be at the UCLA meet this weekend and can scope her out to see what might be up. She injured herself in the middle of her floor routine this weekend and did not compete the rest of her events. However, we do not know the extent of the injury. UPDATE: She posted on Instagram yesterday that she unfortunately tore her ACL and is out for the rest of the season.